A 12 day privately guided journey featuring the very best of Namibia. Highlights include superb safari experiences in Etosha NP, Onguma and Okonjima Nature Reserves. 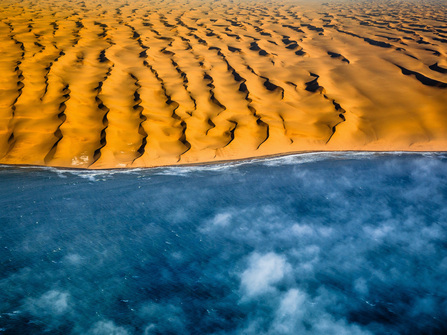 You will also visit the Sossusvlei Dunes, the vibrant coastal town of Swakopmund, and unique geological formations & rock art in Damaraland. 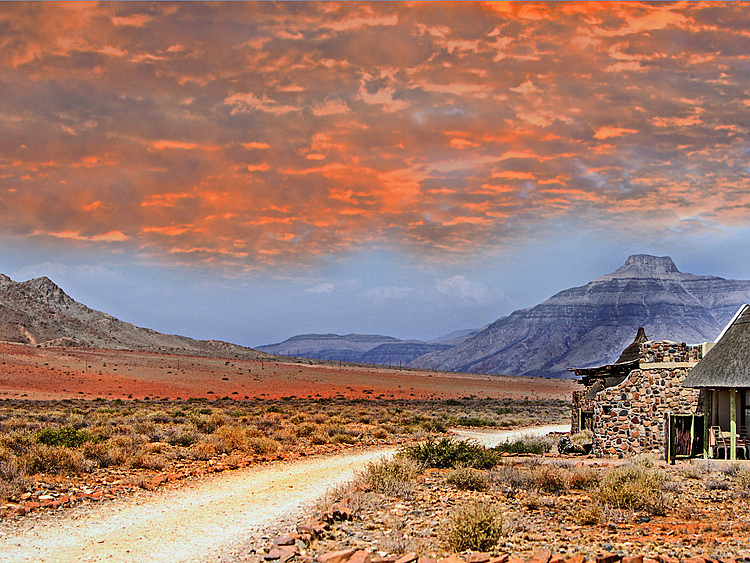 12 day highlights of Namibia itinerary with a private driver-guide. 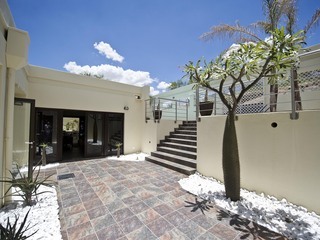 On arrival at Windhoek Airport you will be welcomed and driven in your private, air conditioned 4X4 vehicle to Galton House guesthouse in Windhoek's quiet Eros suburb, conveniently located within easy reach of the capital's many shops and restaurants. The transfer takes around 45 minutes, with stops along the way to stock up on supplies. Today's drive to Sesriem takes the best part of the day, with late afternoon arrival at the Desert Homestead lodge. This friendly and unpretentious property provides comfortable farmhouse-style accommodation with a bar, restaurant and pool. It occupies a superb location just 30 kilometres from the Sesriem entrance to the Namib Naukluft National Park, and boasts fabulous views over the plains to the dunes and mountains beyond. 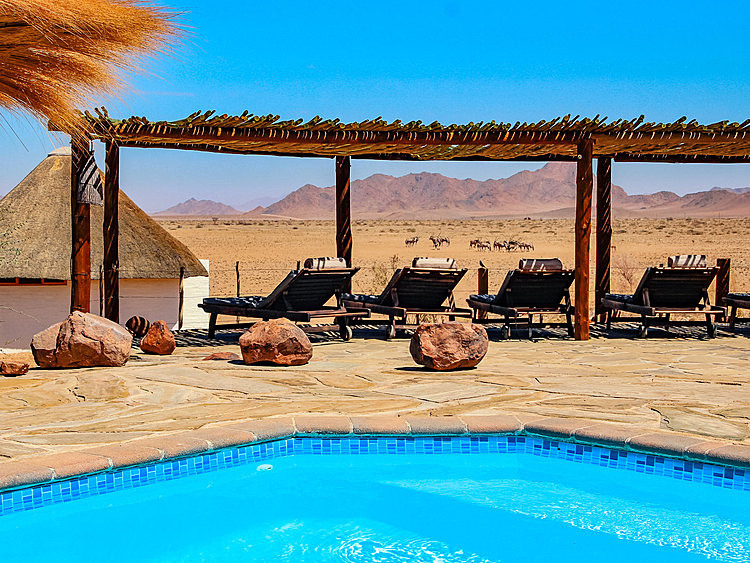 The lodge specialises in horse-back safaris, and also offers nature drives and guided hikes into the Namib Naukluft Mountains. If time allows, a guided nature drive with fabulous sunset scenery provides a perfect end to the day. Make an early start and arrive at the Sesriem entrance to the vast and remote Namib-Naukluft National Park at dawn. This beautiful park comprises a mix of landscapes from expansive gravel plains, to orange sand dunes, inselburgs, and mountain plains. Travel 70 km through the park to reach the 'great dune sea' of Sossussvlei, gigantic dunes which cascade down to the Atlantic Ocean shore. Explore the 500 year-old petrified trees at Dead Vlei, and discover unique desert-adapted wildlife. If time allows, visit the stunning Sesriem Canyon which, at certain times of year, can be a great place for a refreshing swim. Note that the desert can be extremely hot in the middle of the day, so do remember plenty of water, a hat, high factor sunblock and sturdy, enclosed walking shoes. 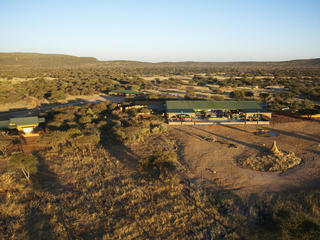 Return to the lodge for a rest and afternoon tea, followed by a guided two hour sundowner horse ride. Ride back to the lodge under the clear night skies in time for dinner. Onwards today to Swakopmund, a vibrant Atlantic seaside town approximately 5 ½ hours' drive from Sesriem via a series of gravel roads and steep mountain passes. Stay overnight at Cornerstone Guesthouse, a peaceful, family-run B&B located between the beach and the town centre. With German architecture harking back to its colonial days, this intriguing town boasts historic buildings, well-maintained gardens, palm tree lined avenues, coffee bars, and some great restaurants. The town is considered a holiday resort by the locals, and is becoming increasingly known for adventure-style activities from gentle sea kayaking, to sand-boarding, quad biking in the enormous dunes, sky diving, fishing, kitesurfing and windsurfing. Temperatures rarely drop below 15C and rainfall is very rare, although note that the town is subjected to 9 months of morning fog each year. Boat cruises in nearby Sandwich Harbour and Walvis Bay are also on offer, along with guided tours into the desert to see the ancient Welwitschia plants. Make the short journey to Walvis Bay by 8.30am and check in for a morning's cruise at the Catamaran Charters café. 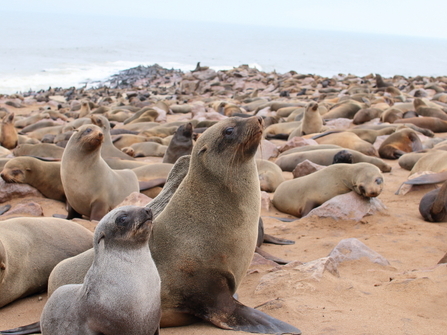 Depart from the Walvis Bay Yacht Club at around 9.00am and cruise into the beautiful bay, and out towards Pelican Point Lighthouse from where the Cape Fur Seal Colony can be seen, with large numbers of playful seals both in and out of the water. See the local oyster platforms and learn about the industry, and enjoy the area's enormous bird diversity. Species include flamingos, pelicans and cormorants. Depending on the time of year, and of course on luck, you may also see dolphins, and occasionally the bizarre mola-mola (sunfish), leatherback turtle, or whale. Return to the yacht club at around 12.30pm. The rest of the day is to spend at leisure in Walvis Bay or Swakopmund. 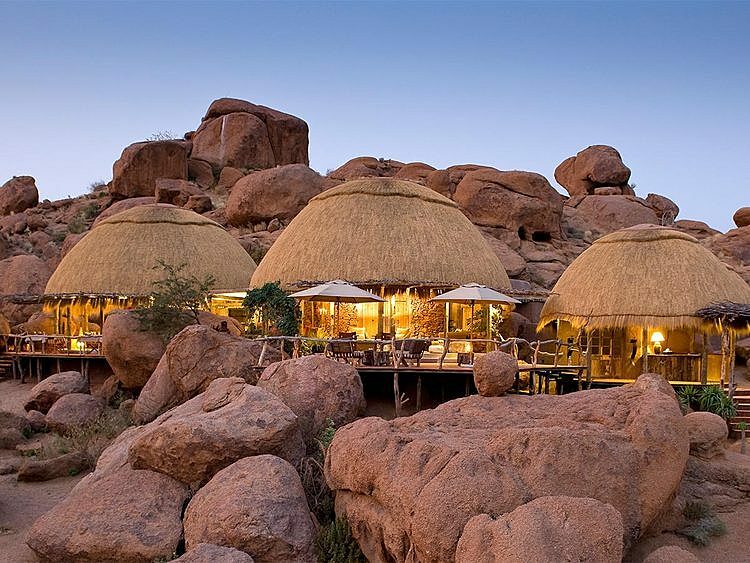 Today's five hour journey leads to Camp Kipwe in southern Damaraland. This charming and quirky camp is huddled directly into the rocks, with sweeping views across the Aba Huab Valley. Each of the 10 eco-friendly, igloo-shaped rooms has a private veranda and charming outdoor bathroom. Guided morning nature drives are on offer, in search of Namibia's unique desert-adapted elephant. Afternoon excursions to Twyfelfontein, a world heritage site boasting impressive boulders inscribed with Africa's greatest concentrations of rock paintings and engravings, last around 2 ½ hours and include visits to the Burnt Mountain, and the famed series of volcanic rock formations known as the 'Organ Pipes' which appear to shimmer in bright sunshine. 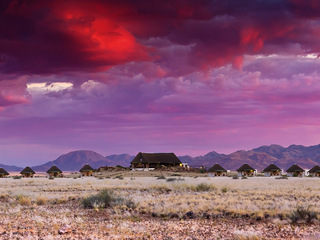 If time allows, it's also possible to visit Damara Living Museum, a nearby community venture introducing visitors to local people and traditions, plus there are a number of guided nature walks in and around camp. A full day to relax and enjoy activities in and around camp. 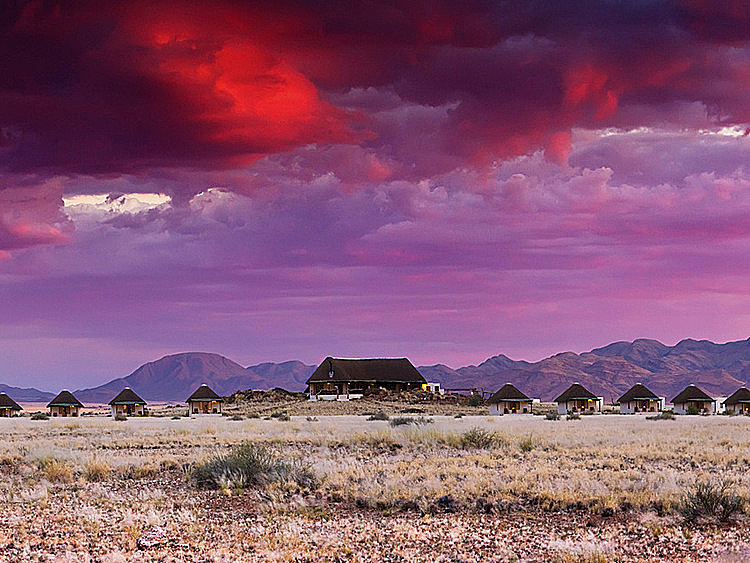 After witnessing Damaraland’s fascinating geological formations, travel today to the western side of the Etosha National Park for a contrasting change of scene. The park's chalky and sun-scorched 'lunar' landscape is home to a rich variety of wildlife including the rare black rhino, elephant, giraffe, eland, blue wildebeest, zebra, impala, an abundance of big cats, and an impressive array of birdlife. Overnight at the Okaukuejo Rest Camp, a former military outpost now offering pristine and comfortable accommodation, along with a bar, restaurant and swimming pool. The camp's main draw is it's waterhole, floodlit at night and attracting an amazing diversity of animals including lion, elephant, the endangered black rhino, and plenty more. 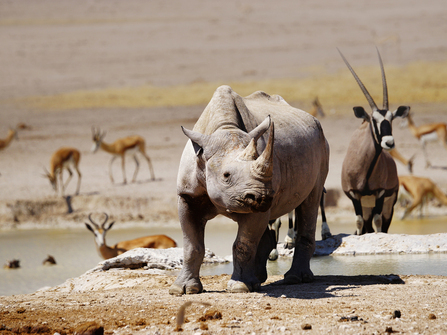 Originally part of the greater Etosha Game Reserve, Onguma Game Reserve is one of Namibia’s best kept secrets. Plains game roam freely and predators, although not easy to spot, are nevertheless common residents of the area. Lions, however, are frequently sighted and there are healthy black rhino, leopard, and hyena populations. During the summer months, Onguma becomes a bird-watchers paradise with thousands of species migrating to wetlands created by the seasonal rains, and the reserve boasts the biggest breeding colony of white-backed vultures in Namibia. Stay overnight at the Onguma Bush Camp, a superb 19-roomed, safari-style camp with a small games room, swimming pool, thatched bar, and a lounge and dining area overlooking a superb waterhole frequented by abundant wildlife around the clock. Enjoy a relaxing day enjoying the scenery and taking part in one or two of the optional activities on offer as preferred. 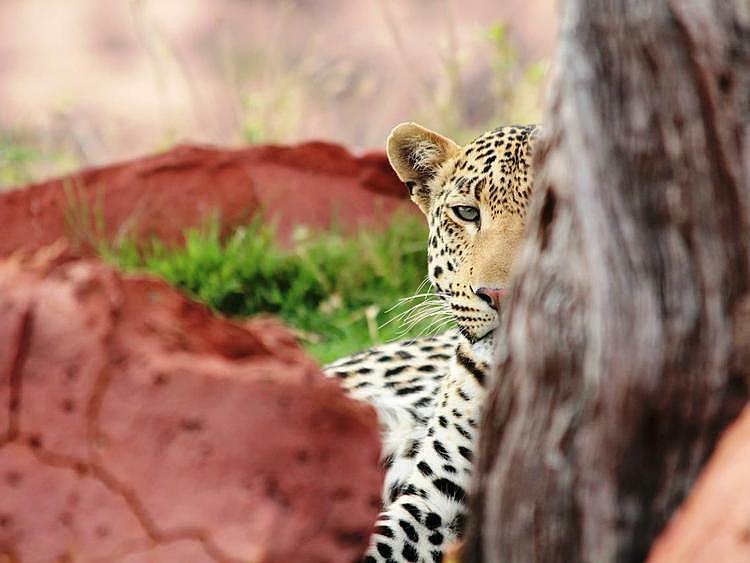 Activies include Big Five game drives, birdwatching, sunset drives, and bush walks. 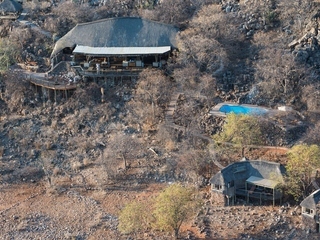 Situated halfway between the capital Windhoek and the Etosha National Park, the 55,000 acre Okonjima Game Reserve has some of the best accommodation in Namibia, but the true highlights are thrilling game drives, informative nature walks, visiting the AfriCat Carnivore Care Centre and participating in the ‘Okonjima Experience’, where visitors actively participate in a leopard sustainability programme by collecting and collating data with their professional guide. The elegant Okonjima Luxury Bush Camp is a wonderful place to stay, combining Edwardian safari elegance with an abundance of modern creature comforts. There are 8 private split-level chalets with stunning views, and facilities include a main ‘lapa’ in the shape of a camelthorn pod, a dining area, and lovely gardens with a swimming pool overlooking the grassy plains. Your guide will transfer you to the airport to arrive in time to connect with your onward flight out of Windhoek International Airport. You should arrive no later than 2 hours before your flight departs. 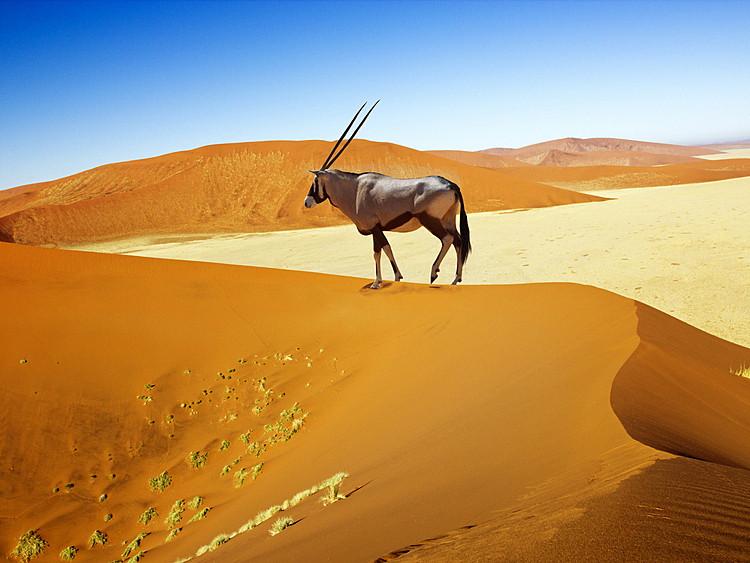 Namibia has excellent regular connections via Johannesburg (and less frequently via Cape Town). Air Namibia also operates via Frankfurt. Extensions to Botswana and the Victoria Falls are possible with regular connections. Flight prices on this route are always cheaper booked in advance, particularly when flying during school holiday periods. Please let us know your preferred departure airport and we would be pleased to quote for a flight inclusive ATOL protected package. Guide price is based on peak travel (August) and inclusive of private driver-guide, 4wd vehicle, accommodation, park fees and mentioned activities. 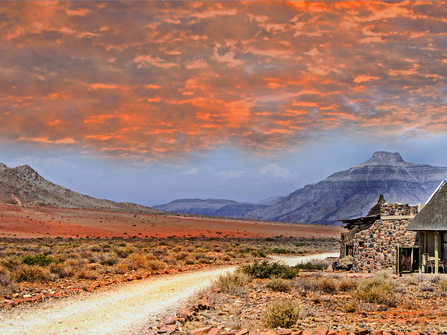 Having an expert local driver-guide allows you to make the most of your time in Namibia adding colour and insight to the journey. You can relax and enjoy the scenery without needing to worry about driving. For those preferring a lower cost, more independent option, we can also offer this itinerary as self drive.